Repost from MINING.COM | Copper and base metals markets are having terrible week, but the rally in the price of cobalt shows no signs of fizzling out. The metal quoted on the LME rose to a fresh 9-year peak of $81,500 a tonne yesterday, a 147% surge since the beginning of 2017. Lithium carbonate prices began its run up two years ago, going from $6,100 per tonne to average $23,350 so far this year on hopes of a boom in demand from electric vehicle manufacturers. Nickel, where EVs hardly registers on the demand side compared to steelmaking, have also been swept up by the positive sentiment and last year prices jumped by 25%. BMW recently said it believes its needs for car-battery raw materials will grow 10-fold by 2025 and that it had been surprised by “just how quickly demand will accelerate”. BMW plans to offer 25 electrified vehicles by 2025 and like many of its peers prefer the use of nickel-magnesium-cobalt batteries (EV pioneer Tesla’s battery technology does not require cobalt). Traditional carmakers are scrambling to retool their businesses for the electric vehicle market. In January Ford said it’s doubling its investment in the sector to $11 billion over the next five years. French carmaker Peugeot said it’s returning to North America with an entire fleet of electrified vehicles by 2025 while Volkswagen is targeting a 300-model battery-powered lineup by 2030. Volkswagen will invest more than $40 billion in the next five years as part of a push into battery-powered vehicles and autonomous-driving systems. Daimler AG is spending 10 billion euros on 10 battery models by 2022. BMW said separately on Friday that it put a procurement partnership with Daimler on ice as a result of an investigation into potential antitrust behaviour by German carmakers Reuters reports. 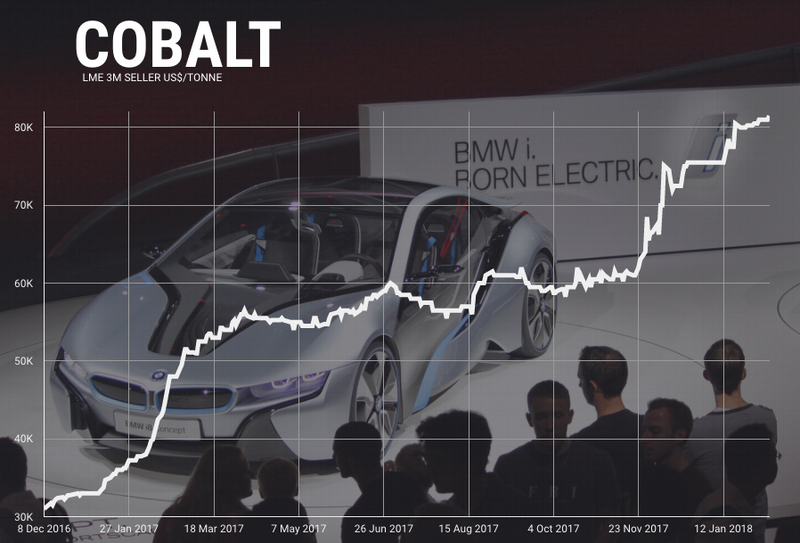 The boom in electric cars could more than quadruple demand for cobalt to in excess of 450,000 tonnes by 2030 from less than 100,000 tonnes last year, according to Bloomberg New Energy Finance.